Birdsell, B. (2015). Self-access learning centres and the importance of being curious. Studies in Self-Access Learning Journal, 6(3), 271-285. Self-Access Learning Centers (SALCs) have become common at many universities in Japan. They provide a learning space to actively interact with a foreign language. These centers are self-access and thus promote autonomous learning, so one of the challenges they have to overcome is the difficulty of attracting students to voluntarily enter and participate in such a learning environment. This article reports findings from a study, which examined associations between items on a curiosity scale and students’ exploratory behavior to seek out and participate in activities at the SALC. Implications for foreign language education and suggestions for future research are discussed. Self-access language centers (SALCs) at Japanese universities continue to expand, as The Japanese Ministry of Education, Culture, Sports, Science and Technology (MEXT) urges universities to develop educational programs that develop “global citizens” (MEXT, 2012). One facet of this educational goal is to improve students’ English abilities, especially their communicative abilities, as Japan ranks near the bottom of 30 Asian countries on the TOEFL (iBT) test (TOEFL, 2007). Japan has a long history of struggling with English despite the amount of time spent studying it (a minimum of 6 years of formal education). IMD, a Swiss education research group, regularly ranks countries on world competitiveness by looking at 338 different measurements. These range from employment to social framework and from attitudes and values to education. From the data, the group then develops an index of each country’s strengths and weaknesses. For instance of the 60 countries that IMD assessed, Japan scored highest on life expectancy and 2nd on environmental engineering, but scored 58th for foreign language skills in 2012. Though in 2014, this ranking slightly improved to 54th (MEXT, 2014). In response to this need to improve the country’s foreign language skills as a means to become more globally competitive, many SALCs were formed through MEXT sponsored grants. These SALCs may be called by a number of different names such as “World Plaza” at Nanzan University, “Global Hub” at Fukui University, and “English Lounge” at Hirosaki University. Their aims though are very similar, as they all seek ways to engage, motivate, and improve students’ confidence and competence with a foreign language, which typically means English. They also seek to empower learners to take control of their own learning and become more “autonomous” learners. The SALC at Hirosaki University, where this research was conducted, was formed in the spring of 2012. The center offers an open space for students to practice their communication skills with a foreign teacher that is on duty. Recently foreign exchange students have also been hired as part-time teacher assistants to help attract and interact with the Japanese students. In addition to this space, there are a number of computers in the room. Frequent users of the SALC are rewarded with an access code to English learning software (Word Engine and English Central). The SALC also offers mini seminars in an open classroom space with topics ranging from TOEIC and TOEFL classes to learning English through music and various cross-cultural classes. One major issue that many SALCs face, since they are in their nature “autonomous” learning centers, is attracting and retaining students because they do not receive any credit from attending any of the seminars or utilizing the space in any way. Entering into these centers for many students can be similar to crossing over an unknown threshold. For traditional classrooms fit a certain conceptual frame. Students enter, there are desks for the students to sit, a teacher enters, the teacher is positioned in the front of the room, and the teacher commences a lesson either through a lecture or discussion. Students listen, take notes, and may discuss a certain topic, which most likely is taken from a textbook. While many students may not even have a conceptual frame for a SALC, as many students frequently ask the staff: “what exactly can I do there?” These centers are viewed as novel and unfamiliar spaces and promote a more unconventional style of learning. Since the success of these centers comes down to the number of students who utilize the space, it is crucial to better understand what factors may drive a student to explore and continuously use the resources provided by the center. There are obviously numerous factors, but the one investigated in this paper, is the role of curiosity. 1) What role does curiosity play in influencing students’ behavior to explore, seek out, and discover a self-access learning center at a university in northern Japan? In the following sections I first look at individual differences and more narrowly at one specific difference that is often overlooked in the field of Second Language Acquisition (SLA) and that is curiosity. I then introduce an exploratory study that investigates the role curiosity plays in motivating students to enter a SALC. Finally I discuss the importance of supporting and enhancing students’ curiosity, not only with language learning, but a more general curiosity, for it is this exploratory behavior that is key to the success of these alternative learning spaces. In foreign language learning five individual differences traditionally stand out as the most prominent factors of research in SLA: language aptitude, motivation, learning and cognitive styles, learning strategies, and anxiety (Dörnyei, 2005). Another important individual difference that has also grown in popularity alongside motivation is self-efficacy, which Bandura (1997) defines as “beliefs in one’s capabilities to organize and execute the courses of action required to produce given attainments” (p. 3). Besides these widely researched constructs in SLA, Dewaele (2005) has fervently put forward the need for SLA researchers to investigate emotional issues involved in L2 acquisition. Likewise Dörnyei (2009, p. 184) more recently also proposed another set of personality facets that could arguably be included in the list of individual differences such as: emotions, interest, and general knowledge. Whether or not interest is in itself an emotion is up to debate (Silvia, 2006, 2008), but in this research I look at curiosity, as an emotional-motivation state (Kashdan, Rose, & Fincham, 2004), that propels an individual to undertake exploratory behavior. Curiosity has been called “the wick in the candle of learning” (Kang, et al., 2009) and essential for survival (Bruner, 1966) and this propensity towards curiosity in humans is a good thing (Gazzaniga, 2005), despite proverbs suggesting otherwise. Daniel Berlyne, one of the more influential researchers into exploratory behavior, distinguished between two types of curiosity; one is the desire to acquire new knowledge, which he labeled as “epistemic curiosity” (EC), and the other is the desire to acquire new sensory experience, which he labeled “perceptual curiosity” (PC), and it is these two desires that motivate exploratory behavior (Berlyne, 1960). Epistemic curiosity is that “drive to know” (Berlyne, 1954, p. 187), which involves trying to solve puzzles, filling in gaps of knowledge, seeking out new information, playing with ideas, and exploring the unfamiliar. While perceptual curiosity involves the sensory modalities like the visual, tactile, auditory, and gustatory and seeking out new and increased perceptual stimuli rather than the familiar and habitual. More recently though in a similar approach, Kashdan and Silvia (2009) defined curiosity “as the recognition, pursuit, and intense desire to explore novel, challenging, and uncertain events” (p. 368). The key factor to curiosity is having this desire to explore, so it is an active response, as opposed to a passive or indifferent response, to a situation that involves the unfamiliar and novel. Curiosity can be viewed as an aspect of one’s personality and in this way approached as a personality trait or on the other hand as an aspect of a specific situation where it more closely resembles a motivational state. Langevin (1971) distinguished two types of curiosity; “breadth of interest” and “depth of interest” and concluded that the former resembles a personality dimension (trait curiosity) and the latter a motivational state (state curiosity). Trait curiosity, broadly speaking, is an individual’s inclination to explore novel and unfamiliar situations while the state form of curiosity involves having curiosity for a specific situation. For example, the situation could be about learning a foreign language, coming into contact with a foreign culture, or exploring new and unfamiliar types of music. Obviously state curiosity will be highly influenced by the individual’s interest in that specific situation, like learning a foreign language, while trait curiosity is viewed as a more general personality trait. Individuals will differ in trait curiosity, which does not mean that some people are curious and others are not, but rather it is a matter of degree, as some people will display greater levels of curiosity than others. Kashdan and colleagues (2004) identified two factors in trait curiosity: exploration and absorption. These two factors represent the seeking out of novel situations and becoming fully engaged in the situation. This two-factor model they call a “positive emotional-motivational system” (Kashdan, et al., 2004, p. 291). In a later article, they rename these two dimensions as stretching and embracing. Stretching is the motivation to go beyond the known and seek out new knowledge and new experiences. Embracing is the attraction to the novel and unfamiliar (Kashdan, et al., 2009). Trait curiosity should have some predictability of exploratory behavior and in the case of this research, it is predicted that those who visit the SALC at this university, which is viewed as a challenging, novel and foreign learning environment, should be individuals with higher levels of curiosity. Orienting their attention to get involved with this center is both cognitively and behaviorally an exploratory situation. To explore the influence of curiosity among Japanese university students and what relationship this individual difference may have on entering into a self-access learning center, I tried to collect as random a sample as possible from the student body. The participants in this study were 226 university students (n=127 female) dispersed among the various faculties at the university: Humanities (n=48), Education (n=67), Agriculture and Life Sciences (n=22), Science and Technology (n=72), and the schools of Medicine (n=5) and Health Sciences (n=12). A 2-page questionnaire was developed to measure curiosity. At the top of the questionnaire, there was a small section where informants provided some basic information about themselves such as gender, faculty, and whether or not they have visited the Self-Access Learning Center at the university. The questionnaire was anonymous. Below this section there was a 25-item curiosity scale. The items were pooled together from various sources. 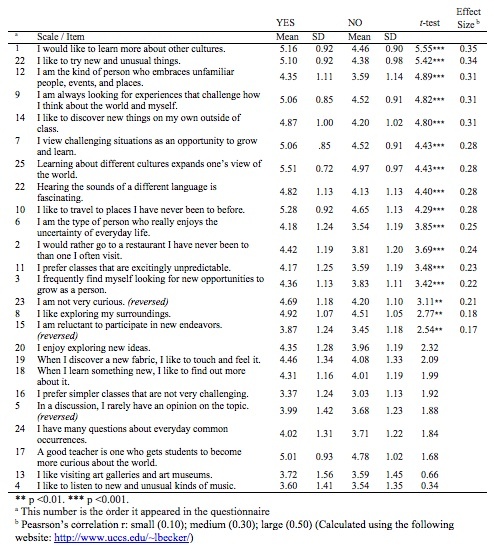 Some of these include the measurement scale on perceptual curiosity (Collins, Litman, & Spielberger, 2004); the Melbourne Curiosity Inventory (Naylor, 1981); Maw and Maw’s (1968) self-appraisal of curiosity scale; and the more recently developed curiosity and exploratory inventory II (Kashdan, et al., 2009). I also added some additional questions that aim to assess students’ curiosity towards learning about foreign cultures and other classroom and school related curiosity items. These 25-items were then translated into Japanese and pilot tested on a few students with an informal follow up interview asking them the comprehensibility of the items and the Japanese and subsequently minor changes were made to the items to accommodate their suggestions. Participants responded to the statements by indicating their level of agreement on a 6-point Likert scale ranging from “strongly disagree” to “strongly agree”. A 6-point scale was used in order to avoid the middle answer found in 5 and 7 point scales, as Japanese have been confirmed to more frequently choose the middle answer as compared to students in other countries (Chen, Lee, & Stevenson, 1995). Throughout the first-term of the 2015 school year, I visited the university cafeteria on a number of occasions and asked students to fill in the questionnaire. The questionnaire was also available in the Self-Access Learning Center, so when a new student visited the center, he/she was asked to fill it in. The data from the questionnaire was inputted into SPSS (version 22) software. The participants were divided into two groups based on how they responded to the following question: Have you visited the SALC? From this response 83 participants answered, “yes” (female=44) while 143 participants answered, “no” (female=83). Based on these two groupings, a t-test was conducted to explore how these two groups differed in their responses to the various items on the curiosity scale. Table 1 provides a broad cumulative average score of all the items on the Curiosity Scale between the two groups. The difference is significant and has a medium to high effect size. Table 2 then provides a detailed look at each item. The items in this table are arranged from highest to lowest difference between the two groups. Students who had visited the SALC scored higher on every item of the 25-item curiosity scale. This is surprising since many of the items had little or nothing to do with studying a foreign language or related to being interested in a foreign culture. Though for a few items the difference was marginal, 17 items did show a significant difference. Of these 17 items, the following 5 items stand out as having medium to large effect size, which simply means that the magnitude of this difference is rather large. I would like to learn more about other cultures. I like to try new and unusual things. I am always looking for experiences that challenge how I think about the world and myself. I like to discover new things on my own outside of class. As can be seen from these items, only the first one could be directly associated with the SALC since such a learning space promotes cultural exchanges and provides cross-cultural classes. The other four items have little to do with learning a foreign language or culture, but a more general exploratory tendency by the individual. In these items there are a few key words: “new and unusual”; “unfamiliar”; “challenge”; and “discover”. These are all keywords associated with the general trait of curiosity. Such items reflect the importance of curiosity for predicting exploratory behavior such as seeking out alternative learning spaces on campus such as the SALC at the university where this research was conducted. 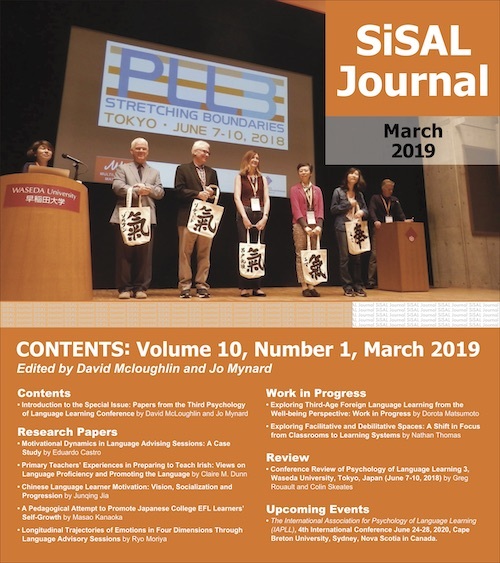 As SALCs mature and develop into a central part of the language learning curriculum at many universities in Japan, one of the fundamental questions that will determine their success or failure is the level of student activity. In this research, I show how curiosity possibly plays an important role in influencing a student’s decision to visit a SALC. Curiosity provides important opportunities for personal growth and in this case, facilitating the exploratory behavior to seek out new experiences like entering into the center. Thus it seems to be crucial to seek new and innovative ways to promote and foster curiosity among the student body. Obviously and most importantly there is the need for the teacher to show signs of curiosity, for curiosity is contagious (Nickerson, 1999). One way to encourage students to show more curiosity about the SALC is to link and integrate classroom-based learning with the self-access learning center (Gardner & Miller, 1999). Under such a model, students use the space to complete some part of a class activity such as a project-based learning activity (Thompson & Atkinson, 2010). Problem-based learning where learners collaborate together to solve a complex, novel, and ill-structured problem (Lu, Bridges, & Hmelo-Silver, 2006) is also another possibility of integrating the classroom and the SALC with the aim of fostering both curiosity in the center but also a more general curiosity. For instance in an English for Specific Purposes class that teaches Economics, the teacher could create a strategic performance problem that deals with investing imaginary money for a client at the beginning of the term. Resources like a financial newspaper and the Internet are made available in the SALC to research and track the investment. Each week the groups have to meet, discuss the performance, and decide whether or not to move the money. Other problem-based learning activities include diagnosing local problems and then making a decision on how to resolves such an issue. Again the teacher promotes the SALC as being available as a platform to discuss their respected problems where they can also receive additional feedback from other students and teachers. Hosting special after hour events that focus on a special theme: holidays, movies, ethnic food demonstrations, etc. As can be seen in the above examples many of these “pull” strategies are very social activities, which follows the growing consensus that SALCs are not simply “self” guided learning centers, but rather are a place for social interaction (Hughes, Krug, & Vye, 2012) and “group autonomy” and a place to learn together with others (Kimura, 2014). Promoting SALCs by linking them with classroom activities that “push” students to become more curious about the space and organizing special SALC activities that continue to “pull” students to maintain their interest are important steps in developing a student centered learning environment. Future research needs to look more closely at how students after this initial exploratory behavior of seeking out new and novel educational experiences like visiting a SALC sustain this interest over time. Of the 83 students who responded that they had visited the SALC only about half of them responded that they had visited four or more times. Getting students into such a center is a positive first step in providing them additional chances to learn the foreign language and experience interacting with foreign teachers, as well as, international exchange students. Yet on the whole, the goal of such centers is to turn this primary curiosity of recognizing and seeking out new knowledge to a more persistent emotional state of interest. Since the time of Dewey (1913) and up to the more modern emotional researches like Tomkins (1962), Kashdan and Silvia (2009), and Hidi (1990) have all noted the profound impact that interest has on learning for “there is no human competence which can be achieved in the absence of a sustaining interest” (Tomkins, 1962, p. 347). Future research could look at what factors influence and sustain students’ interest to continue participating in the self-access learning center while on the other hand what inhibitory factors deter other students from returning a second or third time. Fostering curiosity among the students can have a broad impact on the individual both from an educational and psychological perspective. From an educational perspective, as reported in this article, curiosity propels the individual to explore his/her environment and engage with the novel and unfamiliar. This propulsion sets up many chances for new and alternative learning experiences such as entering and becoming involved in self-access learning centers. Inhibiting students’ curiosity could have a negative impact on the success of SALCs in Japan and more generally the push for Japan to strengthen creativity amongst the young. For instance, Tasuku Honjo, an immunology and genomic medicine professor at Kyoto University, after wining the Tang Prize in Biopharmaceutical Science in 2015, emphasized that curiosity was the most important thing driving his success (Shu-Ling, 2015). Learning happens inside and outside of the classroom and suppressing curiosity suppresses that urge to explore and discover outside the classroom, on one’s own volition and in a more autonomous way. Finding ways to increase student curiosity in the classroom can have a broad impact on the learning environment for “stimulating curiosity is central to education and learning” (Schmitt & Lahroodi, 2008) and may also influence students behavior to explore outside the classroom, especially places like SALCs and other alternative learning spaces that are founded on theories of autonomy. Autonomous learning spaces will have difficulty attracting students if the students themselves are not curious to explore such places. Brian J. Birdsell is a lecturer at Hirosaki University, Japan. He holds an MA in Applied Linguistics from the University of Massachusetts Boston and is a PhD candidate at the University of Birmingham. His main research interests are metaphor, creativity, and individual differences. He keeps a website at www.tsugarupress.com. Bandura, A. (1997). Self-efficacy: The exercise of control. New York, NY: W. H. Freeman. Berlyne, D. E. (1960). Conflict, arousal, and curiosity. New York, NY: McGraw-Hill. Bruner, J. (1966). Toward a theory of instruction. Cambridge, MA: Belknap Press. Dewey, J. (1913). Interest and effort in education. Cambridge, MA: Houghton Mifflin. Dörnyei, Z. (2005). The psychology of the language learner: Individual differences in second language acquisition. London, UK: Lawrence Erlbaum Associates. Dörnyei, Z. (2009). The psychology of second language acquisition. Oxford, UK: Oxford University Press. Gazzaniga, M. (2005). The ethical brain. Washington, DC: Dana Press. Kashdan, T. B., & Silvia, P. J. (2009). Curiosity and interest: The benefits of thriving on novelty and challenge. In C. R. Snyder & S. J. Lopex (Eds. ), Oxford handbook of positive psychology vol. 2 (pp. 367-374). New York, NY: Cambridge University Press. Lu, J., Bridges, S. M., & Hmelo-Silver, C. (2013). Problem-based learning. In K. Sawyer, (Ed. ), Cambridge Handbook of the Learning Sciences 2nd ed. (pp. 298-318). New York, NY: Cambridge University Press. Nickerson, R. S. (1999). Enhancing creativity. In R. J. Sternberg (Ed. ), Handbook of creativity (pp. 392-430). New York, NY: Cambridge University Press. Silvia, P. J. (2006). Exploring the psychology of interest. New York, NY: Oxford University Press. Tomkins, S. S. (1962). Affect, imagery, consciousness: Vol. I: The positive affects. New York, NY: Springer. The Medical School has a separate campus, which most likely explains why these numbers are considerably lower.